Maybe if you're going to critique people on your blog you shouldn't forget the question mark? But the point is well made (and taken). 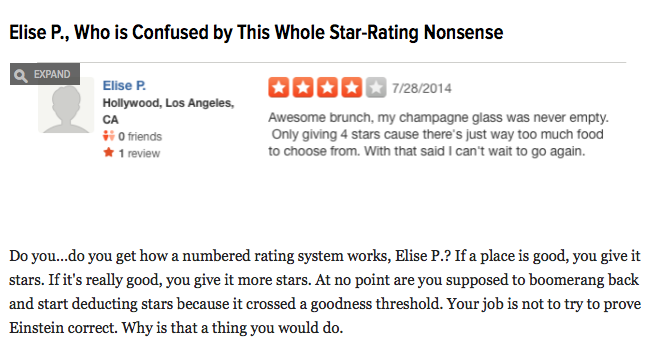 But seriously: this blog (not for the faint-hearted or easily offended) manages to highlight some of the weaknesses of an 'open' un-moderated review site like Yelp. It reinforces a message that we will never tire of hammering home: that the kind of people who write reviews out of the goodness of their own hearts (without being invited or prompted in any way) can be quite an esoteric bunch. To make sure your business is represented by all your customers you must find a way of inviting them that works for you both. Welcome to Dialogue.